The UK has always been widely recognized for their involvement in the equine industry. 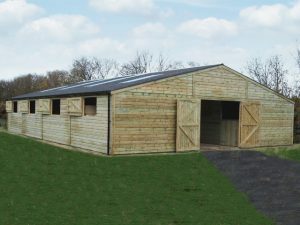 This dates back to the days when horses were used for much of the labour-intensive tasks that were needed to sustain a farm, the UK horse owners were keen on providing good accommodation for their horses and other livestock. This was done using large sturdy barns. While many of these barns still exist today, the changes in concept and trends in agriculture has reduced the need for these types of structures. Now horse owners in the UK participate in horse ownership more for pleasure and for involvement in the horse racing industry or other equine events. This means that many of the old barns are available for other uses. The structure of these barns is what makes them prime for restoration. Those that are going to convert the barns will often favour turning them into Hotels and restaurants or other forms of accommodation like bed and breakfasts. What makes them great for this purpose is first the size of the old barns. These barns had to be built large enough to be able to handle a good selection of horses as well as sheep and cattle. It also had to possess enough room to house the feed and farm equipment of the time. In the modern day with all of this removed it leaves a big open space that can easily be converted to impressive hotels that vary in size. Basically, if a barn could house 20 to 30 horses then it could, realistically, house this number of people in a modern-day hotel. When you think about it each horse would have required their own individual stall. The stalls were large and spacious almost being the perfect size to accommodate a couple in an average sized hotel room. All it takes is restoring the barn to make it modern and accommodating.